Reach over 16,000 readers when you advertise in Whispering Wind Magazine. Use our e-mail address to send for our ad rate package including reader demographics. Banner ads are also available on our Trading Post Links page. Click here for rates. Receive a FREE banner ad with a paid display ad in the magazine! 16,000 readers (3.11 readers per copy) Reader demographics available upon request. WHISPERING WIND Magazine reaches readers in all 50 states. 86% of the circulation is by mail subscription. The remaining 14% is by retail over-the-counter sales with a 60% sell through. 3% of the readership is in Canada and other foreign countries, West Germany and England having the largest European circulation. Reader profiles and current circulation is available on request. MECHANICAL REQUIREMENTS: Trim Size: 8 3/8" X 10 7/8"
Advertisers must supply copy and/or art. 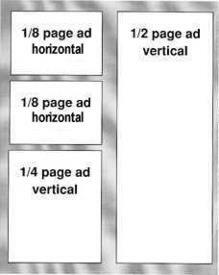 Typesetting, layout, artwork and ad changes not furnished in digital format by advertiser will be charged 25% of first insertion rate for respective ad. This is a one time charge per ad. Ads submitted on disk should be sized correctly as 300 dpi in the following format: TIFF, JPG, PDF files (high resolution with crop marks). 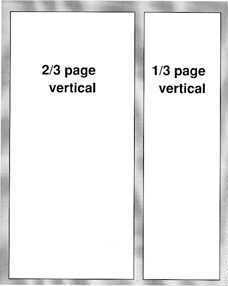 Full page bleed should be 1/4” added to all sides. Photos: IF NOT PROVIDED IN DIGITAL FORMAT: $25.00 per photo. This is a one time charge per photo. There is no charge if furnished on disk. For color ads or photos furnished in digital format; laser proof or original photo is required. We cannot accept film since we are totally DTP. 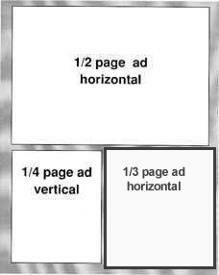 There is no layout charge for digitally furnished ads. Always call for updated closing dates.... we are very flexible and in most cases can fit you into upcoming issue. Advertising received after deadline will automatically fall into next issue's schedule. CANCELLATIONS of advertising must be received prior to closing date. Click here to download ad contract. Call for availability in the current issue. PAYMENT OF ADS: Payment must accompany first insertion. Subsequent insertions will be billed. Discounts apply when advertiser contracts at time of placing ad. All accounts not paid in full within 30 days of date of invoice shall incur a late charge of 1.5% per month from the due date until paid in full. All advertisers must supply the name, address (not post office box) , and phone number, SS# or EIN of the responsible individual for our files. All rates are based on camera ready art including digital files & are quoted as "per issue" rates. Discount rates are based on consecutive issue insertions. Full (bleed): 8 3/8" x 10 7/8"
Full: 7 1/2" x 9 1/4"
2/3 (vert): 4 3/4" x 9 1/4"
1/2 (vert): 3 1/4" x 9 1/4"
1/2 (horiz):7 1/2" x 4 1/2"
1/3 (vert): 2 1/4" x 9 1/4"
1/3 (horiz): 4 3/4" x 4 3/4"
1/4 (vert): 3 1/4" x 4 1/2"
1/4 (horiz):7 1/2" x 2 1/4"
1/6 (horiz): 4 3/4" x 2 3/8"
1/6 (vert): 2 1/8" x 4 7/8"
1/8 (horiz): 3 1/4" x 2 1/4"
Name & address counts as 5 words. Ad position at the discretion of the editor. 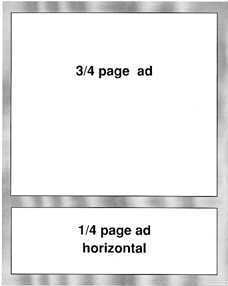 For specific ad placement position requested by advertiser, add $15 per issue. 15% to recognized advertising agencies. Commission based on ad space charge only. $100/m from advertiser supplied cards. 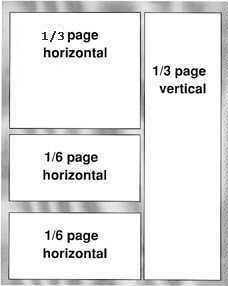 E-mail or call for size specifications and quantity specifications. Reach our foreign subscribers with your promotional piece for only $1.10 per ounce. Call (1-800-301-8009) or email: info@whisperingwind.com for current quantity needed.